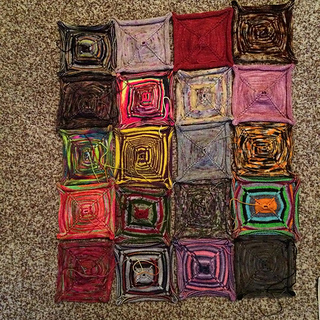 Started this blanket after seeing Shannon/MinervaTurkey’s squares in progress. I’m absolutely loving this, because it’s literally a knitted scrapbook of my knitted memories. 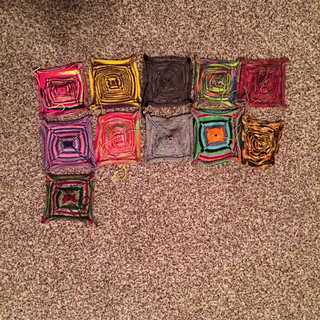 Each scrap is from a former project, or from friends, so each and every square has a memory attached to it. I don’t care if it takes me 10 years to finish because I just love working on the squares. I am using the 2.75mm needle to knit the squares and I’m binding off using the size 4 needle.